Back in the day, ambitious CFOs rose to corporate leadership because they had a vice grip on the money and they understood the company’s accounting and finances. The ambitious CFO of today needs a bit more to succeed. A big part of success is being prepared when opportunity knocks, and having a clear and current grasp of what new technology can do is critical to your career. A new class of cloud-based technologies is changing the way companies acquire and use information technology—and today’s CFO has an opportunity to capitalize on these technologies to reduce costs, optimize their business, and stake their claim as a strategic leader. The rise of the variable cost business model. Skillful use of cloud-based technology is where companies will find significant opportunities to grow their business and manage their costs and profitability. Until now, companies made large up-front capital investments to acquire the technology they needed. New applications often took years and cost millions of dollars to acquire and install. That has changed. Using cloud technology, companies can now acquire and begin using a wide and rapidly growing range of applications. You pay little or nothing up front to get started, and usually get started using the new application within a few hours or a few days. Then each month you pay only for what you use. In a high change and unpredictable economy such as today, traditional fixed cost business operating models become increasingly risky when unexpected events occur. The use of cloud technology moves a large portion of your company’s operating costs (its technology costs), from a fixed cost to a variable cost. This gives you better control of operating costs and preserves profit margins even as business conditions change in unpredictable ways. Cloud technology changes how technology is acquired and used. Applications such as order entry and customer payment to inventory management, human resources, accounting and financial reporting are all available as cloud-based applications. These applications are known as software-as-a-service or SaaS. And new wave of SaaS technology is making itself felt in corporate operations. 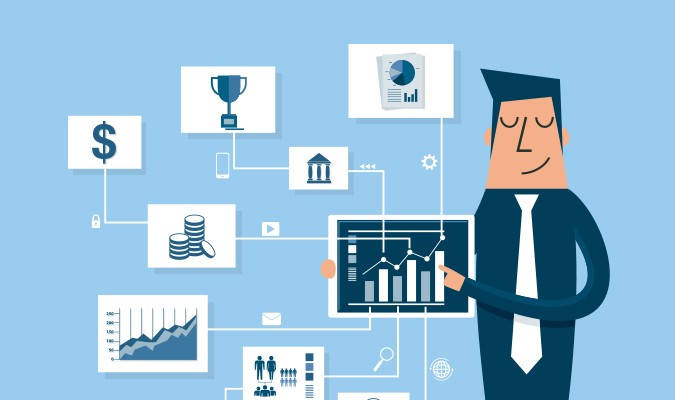 There are technology trends that CFOs need to stay informed about because they will soon (if they aren’t already), be central to the way your company monitors and manages its operations. “Many of these technologies provide the ability to exponentially advance the CFO’s agenda,” says Matt Schwenderman, principal and leader of the Performance Management Technology practice at Deloitte Consulting. Big data. Information technology is imbedded in everything from automobiles to household appliances, and companies use computer applications to support every facet of their business. This generates an enormous amount of data every day, every week, every month. If companies can collect this data and analyze it to find the underlying patterns and trends, they will also find opportunities to increase revenues and decrease costs my making continuous adjustments to their operations day to day as business conditions change. That is the potential of harnessing big data. Data visualization. “Visualization is another powerful tool that can not only help finance uncover previously hidden insights but also enhance finance’s ability to communicate and partner with the business,” says Schwenderman. When companies tap into different data sources and bring that data together in a single place where business operating and sales managers can easily access it, then it has the power to change behavior and drive success. Data visualization make financial data much more understandable and actionable by using a graphic format that is often more familiar and quickly grasped by business people. So big data becomes much more useful. “In-memory computing”. Using new database architectures which exponentially improve data processing times, in-memory computing makes real-time reporting and processing an achievable reality. It also provides financial organizations with the depth of information and quick analysis of critical areas of a business. Finance organizations can do forecasting and planning for the business at different levels from company wide down to individual operating units. Mobile everything. The fourth trend is embodied in the very smart phones that most CFOs now carry. These and other smart mobile devices like tablets and laptops, make big data, data visualization and the power of in-memory computing available to everyone in a company. People can use their mobile devices to access and analyze the data they need when they need it. And the reporting and data visualizations delivered by their mobile devices make the data understandable and actionable. This is what drives business agility and competitiveness in our real-time economy. Effective innovation is practical and pragmatic. CFOs need to partner with the their CIOs and push them to explore new technologies that can enhance or even replace the older generation of technology their company may be using. The CIO needs to become what could be called a Chief Integration Officer; the person who can assess possible innovative new technologies and work with the CFO to find the most efficient way to bring them to bear on problems and opportunities facing the company. Start the conversation with your CIO by asking the question, “How can new cloud-based and SaaS technologies fit into and support the company’s financial and business strategies?” And then CFOs should ask themselves, “What seems impossible, but if it could be done it would change the way we do business?” Then collaborate with the CIO and explore some ways to achieve that goal.